Fortunately—or unfortunately—the search goes on, in spite of you, until this connection is made. Everything you do is that search—until God, the Self, the Heart, enters into the picture, as a reality, in relationship. “The Avon Lady” is a classic talk given by Avatar Adi Da in the early years of His Teaching-Work. In this humorous and penetrating discourse, Avatar Adi Da offers basic instruction regarding the nature of seeking and the Awakening Function of the True Guru. In this audio excerpt from track 3, entitled “There Is Already No Dilemma”, Avatar Adi Da describes the human egoic drama of separation, suffering, and seeking. All pleasures, distractions, and experiences reinforce that same drama of the apparently separate self. But the True Guru does not support the search, does not promise any fulfillment of that search. That is the uniqueness and the invaluable quality of the True Guru. Adi Da compares the True Guru to an elevator – where one steps in, expecting to go up (toward Spiritual attainment or some other fulfillment), but instead the bottom drops out. This is why the search begins to fall apart once there is recognition of the True Guru. Then the real Spiritual process can begin. Listen to an excerpt from Track 3. 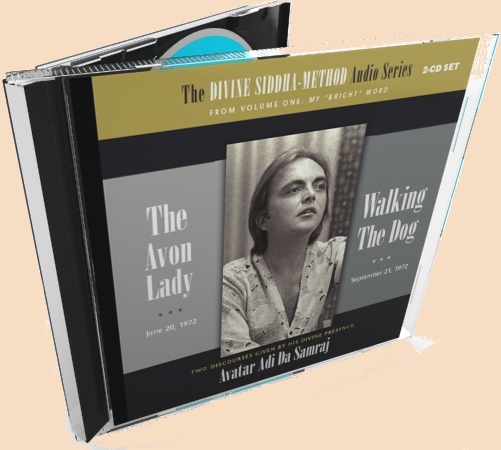 “The Avon Lady” is published as part of a double CD from the Divine Siddha-Method Audio Series. Originally released on cassette tape, the talk is now digitally remastered as a CD for the first time. An archival recording, there are some quality variations. “The Avon Lady” and other discourses from this early period served as the seed-forms from which Avatar Adi Da created one of His earliest books, The Method of the Siddhas (originally published in 1973), now available as My “Bright” Word. My “Bright” Word is the focus of a 17-week teleconference course taught through the Laughing Man Institute by long-time devotee and Adidam educator Anne Henderson. Classes meet for an hour each week and are intimate and conversational, based on recitation, discussion, and “leela”. Tuition is $300 US/217 Euros/181 British Pounds. FIRST CLASS: Wednesday or Thursday, March 12 or 13, 2014, depending on which section of the class you choose to join. Next: An excerpt from the essay "The Avon Lady"